The Interferon gamma (IFN-gamma; 16-25 kDa) is an important regulator of the immune response, produced in activated Th1 cells and NK cells, particularly in response to IL-2, TNF-alpha and IL-12; its production is suppressed by IL-4, IL-10, and TGF-beta. The producing of IFN-gamma is activated by specific antigens or mitogens through the T cell antigen receptor. IFN-gamma polypeptide forms: 40-60 kDa forms are observable under non-denaturing conditions as dimers and trimers; 20 kDa and 25 kDa forms exist due to variable glycosylation. IFN-gamma belongs to the type II interferons, also called immune IFN. 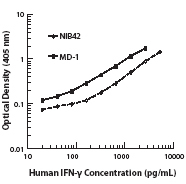 IFN-gamma shows antiviral activity and has important immunoregulatory functions. It is a potent activator of macrophages and had antiproliferative effects on transformed cells. IFN-gamma plays an important role in regulating B cell differentiation by simultaneously stimulating class switch recombination to the IgG3 and IgG2a isotypes while represing class switch recombination to the IgE and IgG1 isotypes. It also appears to promote antigen presentation by B cells through its effects on MHC. Binding of IFN-gamma to its receptor increases the expression of class I MHC on all somatic cells. It also enhances the expression of class II MHC on antigen-presenting cells. IFN-gamma is the major means by which T cells activate macrophages, increasing their ability to kill bacteria, parasites, and tumours. The activation of macrophages by IFN-gamma is essential for the elimination of bacteria that replicate within the phagosomes of macrophages (f.e. Mycobacteria and Listeria monocytogenes). IFN-gamma can potentiate the high antiviral and antitumor effects of the type I interferons (IFN-alpha, IFN-beta). IFN-gamma may also activate neutrophils and NK cells. 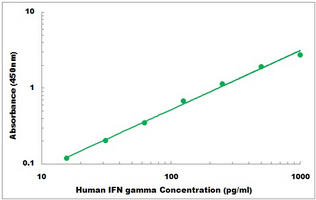 IFN-gamma shows antiviral activity and has important immunoregulatory functions. It is a potent activator of macrophages and had antiproliferative effects on transformed cells. IFN-gamma plays an important role in regulating B cell differentiation by simultaneously stimulating class switch recombination to the IgG3 and IgG2a isotypes while represing class switch recombination to the IgE and IgG1 isotypes. It also appears to promote antigen presentation by B cells through its effects on MHC. Binding of IFN-gamma to its receptor increases the expression of class I MHC on all somatic cells. It also enhances the expression of class II MHC on antigen-presenting cells. IFN-gamma is the major means by which T cells activate macrophages, increasing their ability to kill bacteria, parasites, and tumours. The activation of macrophages by IFN-gamma is essential for the elimination of bacteria that replicate within the phagosomes of macrophages (f.e. Mycobacteria and Listeria monocytogenes). IFN-gamma can potentiate the high antiviral and antitumor effects of the type I interferons (IFN-alpha, IFN-beta). IFN-gamma may also activate neutrophils and NK cells. Wheelock, E.F. (1965) Science 149:310. Ijzermans, J.M. and R.L. Marquet (1989) Immunobiol. 179:456. Mogensen, S.C. and J.L. Virelizier (1987) Interferon 8:55. Grossberg, S.E. et al. (1989) Experientia 45:508. Adolf, G.R. (1985) Oncology (Suppl. 1) 42:33. Samuel, C.E. (1991) Virology 183:1. Pellegrini, S. and C. Schindler (1993) Trends Biochem. Sci. 18:338. Reiter, Z. (1993) J. Interferon Res. 13:247. Boehm, U. et al. (1997) Annu. Rev. Immunol. 15:749. Gray, P.W. et al. (1982) Nature 295:503. Rinderknecht, E. et al. (1984) J. Biol. Chem. 259:6790. DeGrado, W.F. et al. (1982) Nature 300:379. Zoon, K.C. (1987) Interferon 9:1. Ealick, S.E. et al. (1991) Science 252:698. Lunn, C.A. et al. (1992) J. Biol. Chem. 267:17920. Rashidbaigi, A. et al. (1986) Proc. Natl. Acad. Sci. USA 83:384. Pfizenmaier, K. et al. (1988) J. Immunol. 141:856. Aguet, M. et al. (1988) Cell 55:273. Fischer, D.G. et al. (1988) J. Biol. Chem. 263:2632. Calderon, J. et al. (1988) Proc. Natl. Acad. Sci. USA 85:4837. Paliard, X. et al. (1988) J. Immunol. 141:849. Christmas, S.E. (1992) Chem. Immunol. 53:32. Locksley, R.M. and P. Scott (1991) Immunoparasitology Today A58-A61. Billiau, A. and R. Dijkmans (1990) Biochem. Pharmacol. 40:1433. Sen, G.C. and P. Lengyel (1992) J. Biol. Chem. 267:5017. Gusella, G.L. et al. (1993) J. Immunol. 151:2725.15. Mirkovitch, J. et al. (1992) Mol. Cell. Biol. 12:1. 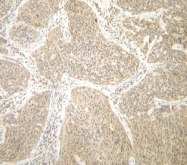 Immunohistochemistry The Interferon gamma antibody stained formalin-fixed, paraffin-embedded sections of human cervical squamous cell carcinoma. The recommended concentration is 0.5 µg/ml-0.25µg/ml with an overnight incubation at 4˚C. An HRP-labeled polymer detection system was used with a DAB chromogen. Heat induced antigen retrieval with a pH 6.0 sodium citrate buffer is recommended. Tissue samples were provided by the Cooperative Human Tissue Network, which is funded by the National Cancer Institute. 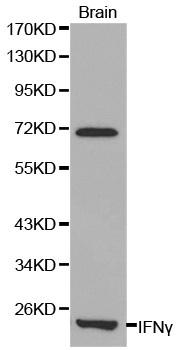 Western Blot unreduced using IFNG / Interferon gamma Antibody Cat.-No PP1019P. Sandwich ELISA using IFNG / Interferon gamma Antibody Cat.-No PP1019P. 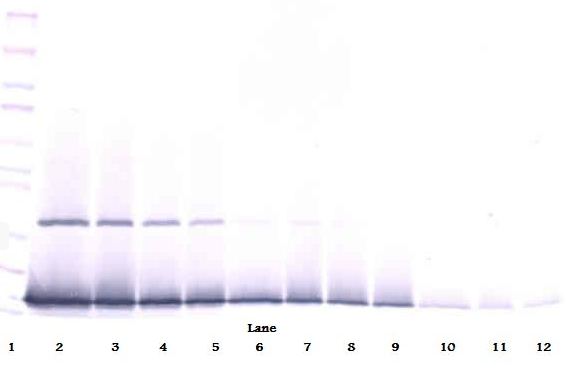 Western Blot analysis of IFNG expression in transfected 293T cell line (H00003458-T02) by IFNG MaxPab polyclonal antibody.Lane 1: IFNG transfected lysate(18.26 KDa).Lane 2: Non-transfected lysate. 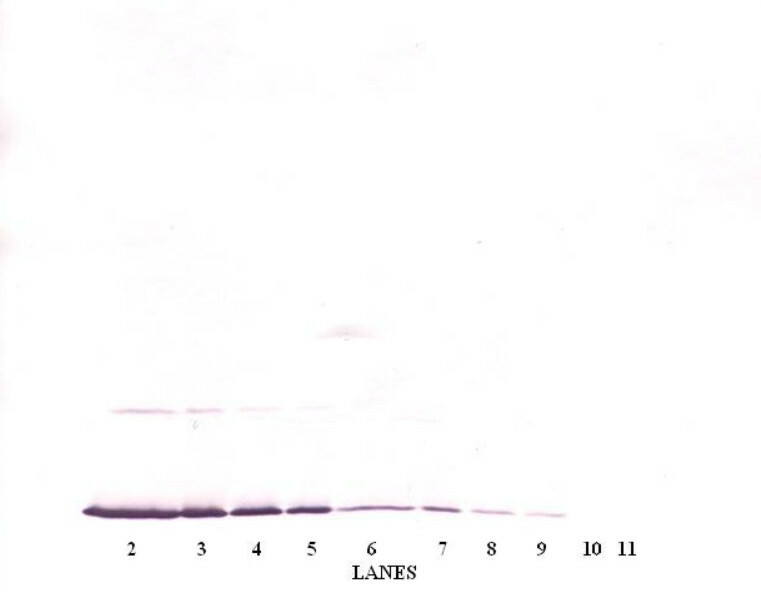 Western Blot analysis of IFNG expression in transfected 293T cell line (H00003458-T01) by IFNG MaxPab polyclonal antibody.Lane 1: IFNG transfected lysate(19.30 KDa).Lane 2: Non-transfected lysate. Immunohistochemistry (IHC) analyzes of IFN-gamma antibody (Cat.-No. : AP20609PU-N) in paraffin-embedded human lymph node tissue. 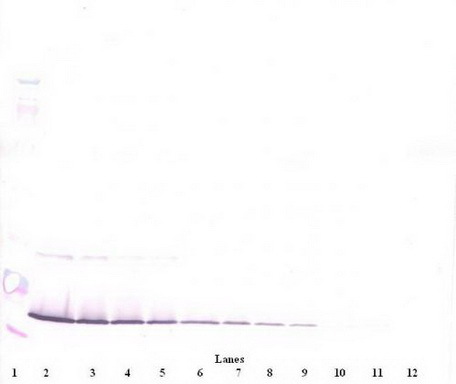 Western blot (WB) analysis of IFN-gamma antibody (Cat.-No. 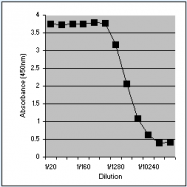 : AP20609PU-N) in extracts from HepG2 cells. 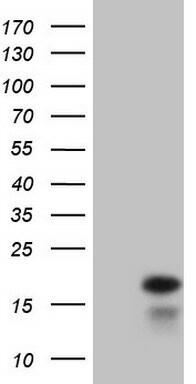 Western Blot analysis using anti-Human IFNG Monoclonal Antibody against Truncated IFNG Recombinant protein. 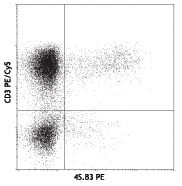 Representative DataClone 45-15 (anti-IFN gamma) was analyzed by flow cytometry: Peripheral blood leucocytes were isolated from a blood sample obtained from a healthy volunteer and subsequently activated, fixed and permeabilized. 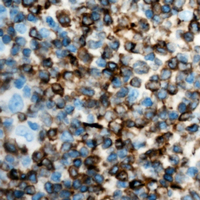 Direct staining was performed using 10 µl of PE-conjugated monoclonal antibody in combination with 10 µl of anti-CD45 FITC per sample. 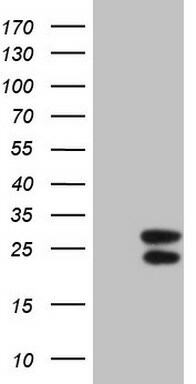 Western blot analysis using IFN gamma antibody Cat.-No AM06079PU-N against truncated IFN-gamma recombinant protein. 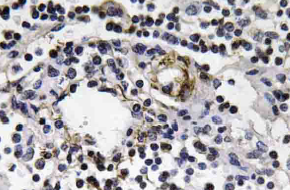 Immunohistochemical analysis of IFN gamma staining in human lymph node formalin fixed paraffin embedded tissue section. The section was pre-treated using heat mediated antigen retrieval with sodium citrate buffer (pH 6.0). The section was then incubated with the antibody at room temperature and detected using an HRP conjugated compact polymer system. DAB was used as the chromogen. The section was then counterstained with haematoxylin and mounted with DPX. Western blot analysis of IFN gamma expression in MOLT4 (A); Jurkat (B) whole cell lysates. HEK293T cells were transfected with the pCMV6-ENTRY control (Left lane) or pCMV6-ENTRY IFNG (RC209993, Right lane) cDNA for 48 hrs and lysed. Equivalent amounts of cell lysates (5 ug per lane) were separated by SDS-PAGE and immunoblotted with anti-IFNG. 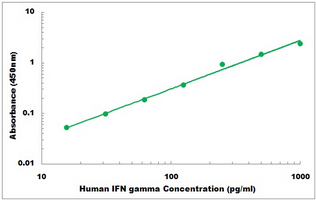 To detect Human IFN-gamma; by direct ELISA (using 100 ul/well antibody solution) a concentration of 0.25-1.0 ug/ml of this antibody is required. This biotinylated polyclonal antibody, in conjunction with compatible secondary reagents, allows the detection of at least 0.2-0.4 ng/well of recombinant Human IFN-gamma;. 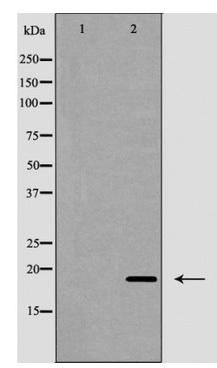 To detect Human IFN-gamma; by sandwich ELISA (using 100 ul/well antibody solution) a concentration of 0.25-1.0 ug/ml of this antibody is required. 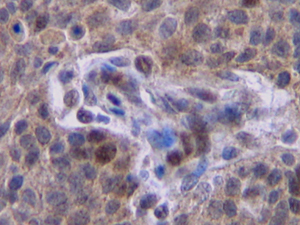 This biotinylated polyclonal antibody, in conjunction with Polyclonal Anti-Human IFN-gamma; (TA328344) as a capture antibody, allows the detection of at least 0.2-0.4 ng/well of recombinant Human IFN-gamma;. 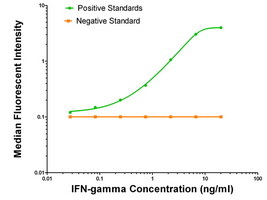 To detect Human IFN-gamma; by sandwich ELISA (using 100 ul/well antibody solution) a concentration of 0.5 - 2.0 ug/ml of this antibody is required. 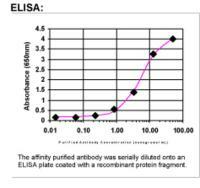 This antigen affinity purified antibody, in conjunction with Biotinylated Anti-Human IFN-gamma; (TA328343) as a detection antibody, allows the detection of at least 0.2 - 0.4 ng/well of recombinant Human IFN-gamma;. 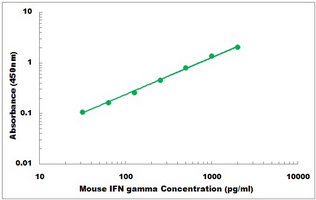 To detect Murine IFN-gamma; by direct ELISA (using 100 ul/well antibody solution) a concentration of 0.25-1.0 ug/ml of this antibody is required. This biotinylated polyclonal antibody, in conjunction with compatible secondary reagents, allows the detection of at least 0.2-0.4 ng/well of recombinant Murine IFN-gamma;. To detect Murine IFN-gamma; by sandwich ELISA (using 100 ul/well antibody solution) a concentration of 0.25-1.0 ug/ml of this antibody is required. 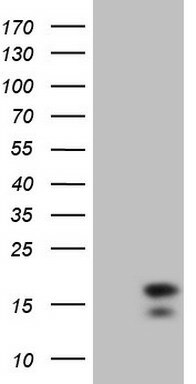 This biotinylated polyclonal antibody, in conjunction with Polyclonal Anti-Murine IFN-gamma; (TA328519) as a capture antibody, allows the detection of at least 0.2-0.4 ng/well of recombinant Murine IFN-gamma;. To detect Murine IFN-gamma; by sandwich ELISA (using 100 ul/well antibody solution) a concentration of 0.5 - 2.0 ug/ml of this antibody is required. 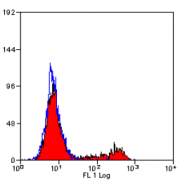 This antigen affinity purified antibody, in conjunction with Biotinylated Anti-Murine IFN-gamma; (TA328518) as a detection antibody, allows the detection of at least 0.2 - 0.4 ng/well of recombinant Murine IFN-gamma;. 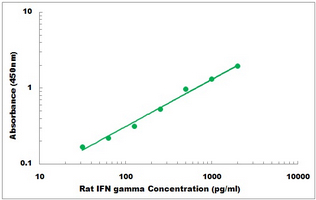 To detect Rat IFN-gamma; by direct ELISA (using 100 ul/well antibody solution) a concentration of 0.25-1.0 ug/ml of this antibody is required. This biotinylated polyclonal antibody, in conjunction with compatible secondary reagents, allows the detection of at least 0.2-0.4 ng/well of recombinant Rat IFN-gamma;. To detect Rat IFN-gamma; by sandwich ELISA (using 100 ul/well antibody solution) a concentration of 0.25-1.0 ug/ml of this antibody is required. 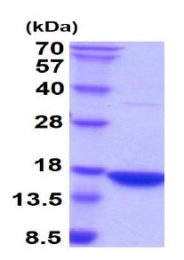 This biotinylated polyclonal antibody, in conjunction with Polyclonal Anti-Rat IFN-gamma; (TA328585) as a capture antibody, allows the detection of at least 0.2-0.4 ng/well of recombinant Rat IFN-gamma;. To detect Rat IFN-gamma; by sandwich ELISA (using 100 ul/well antibody solution) a concentration of 0.25-1.0 ug/ml of this antibody is required. This biotinylated polyclonal antibody, in conjunction with Polyclonal Anti-Rat IFN-gamma; (TA328584) as a capture antibody, allows the detection of at least 0.2-0.4 ng/well of recombinant Rat IFN-gamma;. To detect Rat IFN-gamma; by sandwich ELISA (using 100 ul/well antibody solution) a concentration of 0.5 - 2.0 ug/ml of this antibody is required. This antigen affinity purified antibody, in conjunction with Biotinylated Anti-Rat IFN-gamma; (TA328583) as a detection antibody, allows the detection of at least 0.2 - 0.4 ng/well of recombinant Rat IFN-gamma;. To detect Rat IFN-gamma; by sandwich ELISA (using 100 ul/well antibody solution) a concentration of 0.5 - 2.0 ug/ml of this antibody is required. 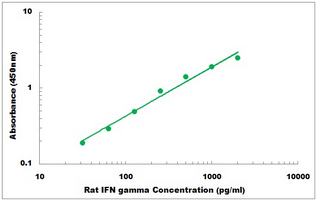 This antigen affinity purified antibody, in conjunction with Biotinylated Anti-Rat IFN-gamma; (TA328582) as a detection antibody, allows the detection of at least 0.2 - 0.4 ng/well of recombinant Rat IFN-gamma;. 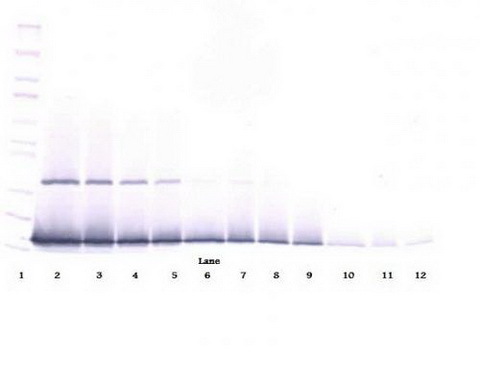 Western blot analysis of mouse brain cell lysate using IFNG antibody. 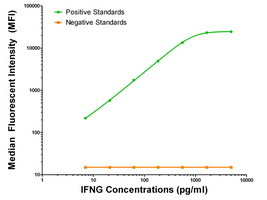 Typical standard curves under optimized assay conditions in sandwich assays using two IFNgamma; antibody pairs with either clone NIB42 or MD-1 as a capture antibody. The detection antibody for both curves was clone 4S.B3. 334 products - FILTER YOUR RESULTS!